Common in Mediterranean cuisine, artichokes feature a unique shape and delicate flavor. Although used in a wide variety of food dishes, artichokes are also widely known for their medicinal uses. Artichoke supplements and artichoke extract have long been used to treat certain health conditions. However, the promotion of artichoke diet pills may be slightly misleading. Considered one of the world’s oldest cultivated vegetables, artichokes are native to various parts of Europe, Africa and the Canary Islands. Along the plant, flowers with edible buds develop. Each bud features multiple leaves and a fleshy bottom. After boiling or steaming the artichoke to soften it, the leaves are typically broken off and eaten one-by-one. Artichoke leaves are commonly dipped in butter, lemon juice, Hollandaise, mayonnaise or another type of sauce before eating. Artichokes are also eaten deep-fried, mixed into warm dips and layered on pizzas. For many centuries, artichoke leaves and extract have also been used for medicinal purposes. In fact, the BodyBuilding website claims that ancient Greeks and Romans used artichoke extract to aid digestion and 19th-century French physicians used it to treat liver problems and jaundice. 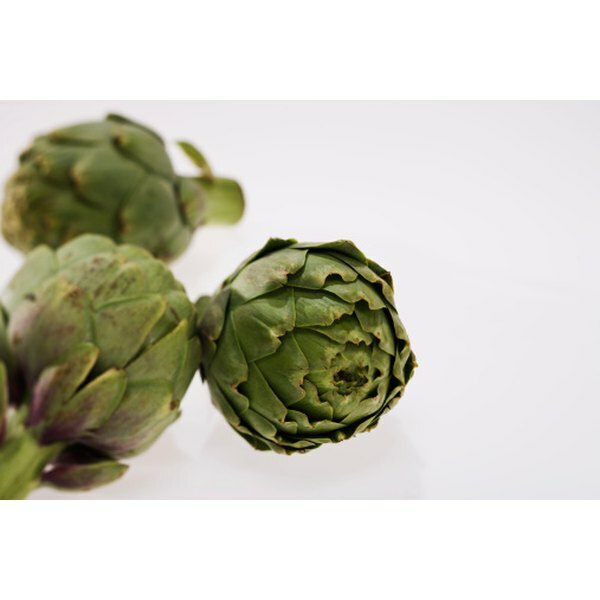 Artichoke extract is made from the basal leaves of the artichoke plant. The beneficial compounds found in artichoke extract include flavonoids, chlorogenic acid, cynarin, luteolin and cyrnaroside. Along with their antioxidant properties, artichoke extract and artichoke supplements have been shown to lower cholesterol levels and relieve the symptoms of irritable bowel syndrome, or IBS, and indigestion. When used as a diet pill, the main benefit of artichoke supplements is its cholesterol-lowering ability. By reducing plasma lipid levels, artichoke extract can significantly lower total cholesterol levels among patients with high cholesterol. Since high cholesterol is a significant risk factor for cardiovascular disease -- CVD -- and death, it can be said that artichoke extract can help reduce the risk of CVD. Unless your doctor has recommended artichoke extract or artichoke supplements to treat cholesterol, indigestion or IBS problems, you may receive more health benefits simply by eating the artichoke vegetable. A large artichoke delivers just around 25 calories and no fat, making it a simple addition to any diet. Artichokes are also high in potassium, vitamin C, magnesium, folate, fiber and antioxidants. When added to a balanced diet, artichokes can be a healthy and beneficial addition. However, artichoke diet pills alone will not help you lose weight, burn fat or decrease appetite. As with any type of diet pill or supplement, consult your physician before initiating the supplement therapy. Although herbal supplements typically do not contain any pharmaceutical ingredients, they can interact with medications and/or worsen disease symptoms. What Vitamins or Minerals Are in Artichokes?